Archimedean solids: John Conway describes some interesting maps among the Archimedean polytopes. Eric Weisstein lists properties and pictures of the Archimedean solids. Brahmagupta's formula. A "Heron-type" formula for the maximum area of a quadrilateral, Col. Sicherman's fave. He asks if it has higher-dimensional generalizations. The charged particle model: polytopes and optimal packing of p points in n dimensional spheres. Circumcenters of triangles. Joe O'Rourke, Dave Watson, and William Flis compare formulas for computing the coordinates of a circle's center from three boundary points, and higher dimensional generalizations. Convex Archimedean polychoremata, 4-dimensional analogues of the semiregular solids, described by Coxeter-Dynkin diagrams representing their symmetry groups. A Counterexample to Borsuk's Conjecture, J. Kahn and G. Kalai, Bull. AMS 29 (1993). Partitioning certain high-dimensional polytopes into pieces with smaller diameter requires a number of pieces exponential in the dimension. Cube triangulation. Can one divide a cube into congruent and disjoint tetrahedra? And without the congruence assumption, how many higher dimensional simplices are needed to triangulate a hypercube? For more on this last problem, see Triangulating an n-dimensional cube, S. Finch, MathSoft, and Asymptotically efficient triangulations of the d-cube, Orden and Santos. DeVicci's Tesseract. Higher-dimensional generalizations of Prince Rupert's cube, from MathSoft's favorite constants pages. Explore the 120-cell! Free Windows+OpenGL+.Net software. Exploring hyperspace with the geometric product. Thomas S. Briggs explains some four-dimensional shapes. The Fourth Dimension. John Savard provides a nice graphical explanation of the four-dimensional regular polytopes. Four-dimensional visualization. Doug Zare gives some pointers on high-dimensional visualization including a description of an interesting chain of successively higher dimensional polytopes beginning with a triangular prism. Grid subgraphs. Jan Kristian Haugland looks for sets of lattice points that induce graphs with high degree but no short cycles. Ham Sandwich Theorem: you can always cut your ham and two slices of bread each in half with one slice, even before putting them together into a sandwich. From Eric Weisstein's treasure trove of mathematics. Hermite's constants. Are certain values associated with dense lattice packings of spheres always rational? Part of Mathsoft's collection of mathematical constants. The HyperSphere, from an Artistic point of View, Rebecca Frankel. Hypercube's Home Page. Speculations on the fourth dimension collected by Eric Saltsman. Hypercube fun. John Atkeson finds a nice recursive drawing pattern for high dimensional hypercubes in two dimensional planes. Hypercube game. Experience the fourth dimension with an interactive, stereoscopic java animation of the hypercube. Hypercubes in hyper perspective. Red-blue 3d visualizations produced with the virtual flower system. Hyperdimensional Java. Several web applets illustrating high-dimensional concepts, by Ishihama Yoshiaki. 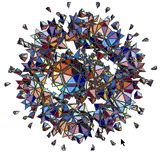 Hyperspace star polytope slicer, Java animation by Mark Newbold. Hyperspace structures. Exploring the fourth dimension. Hyperspheres. Eric Weisstein calculates volumes and surface areas of hyperspheres, which curiously reach a maximum for dimensions around 5.257 and 7.257 respectively. Hyperspheres, hyperspace, and the fourth spatial dimension. M. R. Feltz views the universe as a closed cosmic hypersphere. Jenn open-source software for visualizing Cayley graphs of Coxeter groups as symmetric 4-dimensional polytopes. Keller's cube-tiling conjecture is false in high dimensions, J. Lagarias and P. Shor, Bull. AMS 27 (1992). Constructs a tiling of ten-dimensional space by unit hypercubes no two of which meet face-to-face, contradicting a conjecture of Keller that any tiling included two face-to-face cubes. Max. non-adjacent vertices on 120-cell. Sci.math discussion on the size of the maximum independent set on this regular 4-polytope. Apparently it is known to be between 220 and 224 inclusive. Maximum area cross-section of a hypercube. N-dimensional cubes, J. Bowen, Oxford. Octacube. Stainless steel 3d model of the 24-cell (one of the six regular polytopes in four dimensions), by Adrian Ocneanu, installed as a sculpture in the Penn State Math Department. Includes also a shockwave flythrough of the model. Odd squared distances. Warren Smith considers point sets for which the square of each interpoint distance is an odd integer. Clearly one can always do this with an appropriately scaled regular simplex; Warren shows that one can squeeze just one more point in, iff the dimension is 2 (mod 4). Moshe Rosenfeld has published a related paper in Geombinatorics (vol. 5, 1996, pp. 156-159). Packings in Grassmannian spaces, N. Sloane, AT&T. How to arrange lines, planes, and other low-dimensional spaces into higher-dimensional spaces. Pairwise touching hypercubes. Erich Friedman asks how to partition the unit cubes of an a*b*c-unit rectangular box into as many connected polycubes as possible with a shared face between every pair of polycubes. He lists both general upper and lower bounds as functions of a, b, and c, and specific constructions for specific sizes of box. I've seen the same question asked for d-dimensional hypercubes formed out of 2^d unit hypercubes; there is a lower bound of roughly 2d/2 (from embedding a 2*2d/2*2d/2 box into the hypercube) and an upper bound of O(2d/2 sqrt d) (from computing how many cubes must be in a polycube to give it enough faces to touch all the others). Peek, software for visualizing high-dimensional polytopes. Penumbral shadows of polygons form projections of four-dimensional polytopes. From the Graphics Center's graphics archives. Pictures of 3d and 4d regular solids, R. Koch, U. Oregon. Koch also provides some 4D regular solid visualization applets. Platonic solids and quaternion groups, J. Baez. Plücker coordinates. A description by Bob Knighten of this useful and standard way of giving coordinates to lines, planes, and higher dimensional subspaces of projective space. Polygons, polyhedra, polytopes, R. Towle. PolyGloss. Wendy Krieger is unsatisfied with terminology for higher dimensional geometry and attempts a better replacement. Her geometry works include some other material on higher dimensional polytopes. A quasi-polynomial bound for the diameter of graphs of polyhedra, G. Kalai and D. Kleitman, Bull. AMS 26 (1992). A famous open conjecture in polyhedral combinatorics (with applications to e.g. the simplex method in linear programming) states that any two vertices of an n-face polytope are linked by a chain of O(n) edges. This paper gives the weaker bound O(nlog d). Realization Spaces of 4-polytopes are Universal, G. Ziegler and J. Richter-Gebert, Bull. AMS 32 (1995). Regular 4d polytope foldouts. Java animations by Andrew Weimholt. Also includes some irregular polytops. Regular polytopes in higher dimensions. 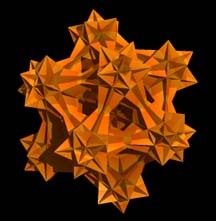 Russell Towle uses Mathematica to slice and dice simplices, hypercubes, and the other high-dimensional regular polytopes. See also Russell's 4D star polytope quicktime animations. Regular polytopes in Hilbert space. Dan Asimov asks what the right definition of such a thing should be. Rubik's hypercube. 3x3x3x3 times as much puzzlement. Windows software from Melinda Green and Don Hatch, now also available as Linux executable and C++ source. Ruler and Compass. Mathematical web site including special sections on the geometry of polyhedrons and geometry of polytopes. Sausage Conjecture. L. Fejes Tóth conjectured that, to minimize the volume of the convex hull of hyperspheres in five or more dimensions, one should line them up in a row. This has recently been solved for very high dimensions (d > 42) by Betke and Henk (see also Betke et al., J. Reine Angew. Math. 453 (1994) 165-191 and the MathWorld Sausage Conjecture Page). Sierpinski pentatope video by Chris Edward Dupilka. A four-dimensional analogue of the Sierpinski triangle. The Simplex: Minimal Higher Dimensional Structures. D. Anderson. Simplex/hyperplane intersection. Doug Zare nicely summarizes the shapes that can arise on intersecting a simplex with a hyperplane: if there are p points on the hyperplane, m on one side, and n on the other side, the shape is (a projective transformation of) a p-iterated cone over the product of m-1 and n-1 dimensional simplices. Skewered lines. Jim Buddenhagen notes that four lines in general position in R3 have exactly two lines crossing them all, and asks how this generalizes to higher dimensions. SMAPO library of polytopes encoding the solutions to optimization problems such as the TSP. Soap bubble 120-cell from the Geometry Center archives. Solution to problem 10769. Apparently problems of coloring the points of a sphere so that orthogonal points have different colors (or so that each set of coordinate basis vectors has multiple colors) has some relevance to quantum mechanics; see also papers quant-ph/9905080 and quant-ph/9911040 (on coloring just the rational points on a sphere), as well as this four-dimensional construction of an odd number of basis sets in which each vector appears an even number of times, showing that one can't color the points on a four-sphere so that each basis set has exactly one black point. Squares are not diamonds. Izzycat gives a nice explanation of why these shapes should be thought of differently, even though they're congruent: they generalize to different things in higher dimensions. Speculations on the fourth dimension, Garrett Jones. Stella and Stella4d, Windows software for visualizing regular and semi-regular polyhedra and their stellations in three and four dimensions, morphing them into each other, drawing unfolded nets for making paper models, and exporting polyhedra to various 3d design packages. The Story of the 120-cell, John Stillwell, Notices of the AMS. History, algebra, geometry, topology, and computer graphics of this regular 4-dimensional polytope. Student of Hyperspace. Pictures of 6 regular polytopes, E. Swab. Tesseract and tesseract-embedded Möbius strip, A. Bogomolny. Tuvel's Polyhedra Page and Tuvel's Hyperdimensional Page. Information and images on universal polyhedra and higher dimensional polytopes. Two-distance sets. Timothy Murphy and others discuss how many points one can have in an n-dimensional set, so that there are only two distinct interpoint distances. The correct answer turns out to be n2/2 + O(n). This talk abstract by Petr Lisonek (and paper in JCTA 77 (1997) 318-338) describe some related results. Uniform polychora. A somewhat generalized definition of 4d polytopes, investigated and classified by J. Bowers, the polyhedron dude. See also the dude's pages on 4d polytwisters and 3d uniform polyhedron nomenclature. Visualizations of 4d hypercube (Java applet). Visualizing the hypersphere via 3d slices, and other four-dimensional thoughts by Jeff Fuquay. Whimsical rendering of a 4-cube. Rick Mabry animates a 3d projection that has a nice symmetrical 2d projection. Send email if you know of an appropriate page not listed here.